Perennial evergreen herbs from a thick, blackish rhizome. 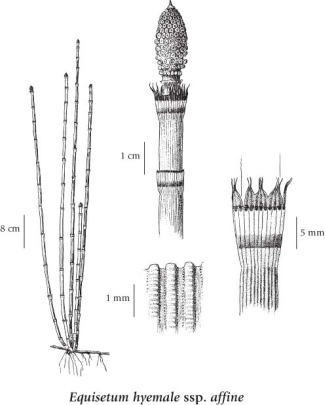 30-120 cm tall, 4-6 mm thick, dark green, their cental cavity more than 2/3 the stem diameter, not branched, the sheaths with 14-50 teeth that fall off leaving only darker traces. 8-15 mm long, the tip tapered to a black-tinged point. Moist alluvial forests, riverbanks, roadsides, clearings and forest margins in the lowland, steppe and montane zones; frequent throughout BC; N to AK, YT and NT, E to NF and S to SC, GA, AL, MS, TX, NM, AZ, and CA. A shade-tolerant/intolerant, submontane to montane, circumpolar horsetail (transcontinental in North America). Occurs on fresh to moist, calcium-rich and nitrogen-rich soils (Moder or Mull humus forms) within boreal, temperate, cool semiarid, mesothermal, and tropical climates; its occurrence decreases with increasing elevation. Inhabits exposed mineral soil; scattered in broad-leaved forests on water-receiving (floodplain and stream­edge) sites, frequent in non-forested, early­seral communities. Characteristic of alluvial floodplain forests.